If you want to know the legacy of a person after they’ve gone, all you have to do is look around at the people left behind. My grandma lived the majority of her life in South Dakota, my dad moved away in his twenties but never lost his country charm. He still says “I suppose” and prefers roast beef to hummus and tacos. When he says “i’m going downtown” I know he is referring to the main street of our small suburb, not the city center of Dallas. These are little things left over from his small town, farm style upbringing. But it is his rich character, his resilience in the face of struggle which I believe has a direct correlation to not only where he was raised, but who raised him. 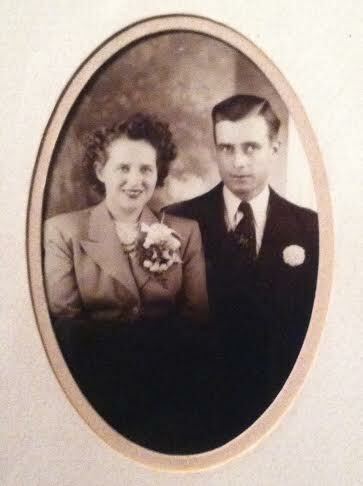 Velma, my grandmother, has always stood out in my mind as a woman of good humor and steadiness. Over the years, I have heard stories of her adventures. Like during WWII, when she got on a greyhound and moved to Chicago, to work in a factory. I think it was a quite a bold move for a twenty-something woman in the 1940’s. I imagine Her marching resolutely around the urban jungle with the look of a strong independent women. I am sure the humor in her eyes was not doused when she got mugged and had her purse taken. Velma was someone to know, which is why Leroy, my grandfather, after hearing stories about grandma, went to Chicago to meet her. One thing lead to another, and like all classic tales they fell in love in got married. They knew what they wanted, which is why it only took them three days to get engaged and three weeks after to get married. It’s interesting to me how most often it takes death for us to look full force at someones life. Maybe this is the beauty of it, the gift death gives us unintentionally. The opportunity to celebrate and see the tapestry of stories woven together. My dad could never have known he would have to face a crippling disease, but the resolve and steadiness of my grandma gave him the courage to face each day without complaint. And even though he couldn’t be here today, he had this to say about his mother. There are many characteristics about mom, I just picked two that I like. One is her sense of humor and the other is her faith. One time when I was about nine years old, I was standing in line at the school bus and there was a big, tall girl in front of me. She wasn’t just tall, she was big. She turned around and looked down at me and said, “shrimp!,” and being pretty small for my age it hurt my feelings. Of course she didn’t mean it seriously, but it made me laugh. Then he stopped long enough to say, “Pass the potatoes.” And quick as a wink my mom scarfed up one of those baked potatoes off the plate and fired it across the table. It hit dad in the chest and fell on his plate. He was dumbfounded, and of course us kids split a gut laughing. She agreed with me, and said that she adhered to that. She also told me “I pray for you every day.” I didn’t know that, and it touched me. That was only about a year ago. That quality had a profound effect on my reverence for God. My dad is a story teller. He has always found ways pump life and color into the memories of his childhood and young adult life. We as a family were only able to visit in South Dakota on a few occasions due to distance and my dad’s health, but through my dad’s stories, I have been able to experience a taste of what it would have been like to grow up with Grandma Velma. I’ve learned my grandmother was tenacious. I’ve learned my grandmother was faithful. I’ve learned my grandmother was stead and strong. Most importantly, I’ve learned she was a jokester. My grandmother never had much in the way of material possessions, but the best gift she has given all of us, is her character. This was great, Krisi. Love how you say things and chuckled at your Dad’s stories. He must have picked up his sense of humor from his Mom.